While enrolled at THINK Global School, students are encouraged to be creative during the course of their studies and travels. When the students document these thoughts, we are often delighted with the results. In “Back and forth to the Ajanta and Ellora caves,” 10th grade student Paul S. uses travel writing to document his recent journey to Aurangabad, India, where he and his fellow classmates visited Jain, Buddhist and Hindu caves. 37 hours on a bus. Sitting, talking and staring for 37 hours. Some might think that 37 hours on a bus are wasted; however, I believe it’s really your decision what to make out of it. You can either let it ruin your entire journey and make all that time worth absolutely nothing, or you can read, sleep, eat, talk, listen, watch, surf, compete, observe, and, most importantly, enjoy. I can proudly say that I achieved every single one of these on our most recent trip. I read about 300 pages of Der Schwarm by Frank Schätzing; I caught up on a lot of sleep (and also lost some again). I ate several delicious Bhutanese apples and also tried roti, an Indian flatbread made with chapathi and spices. I listened, or rather we listened, using speakers and a 5-plug headphone connector; I discovered a new TV series for myself and managed to be awarded last place in the first official TGS bus surfing tournament. And for a very long time, I just stared out of the window, watching and observing people, their homes and their land. More than anything else, I repeatedly saw one thing: crops. Usually large areas of crops speak of a flourishing agricultural sector, increasing the wealth of both farmers and their employees. However, these massive fields of crops stood in stark contrast to the poor infrastructure around them; most homes I saw were hardly recognizable as buildings. This speaks of a problem many developed and developing countries are experiencing right now: big agricultural companies keep buying more and more land, taking away the main source of income from traditional farmers. After about 13 hours on a bus, crossing three different states and many, many roads and highways, we arrived in Aurangabad at 3:30 am. My roommate Jonah and I arrived exhausted in our rooms and after quickly unpacking our bags, both of us fell asleep quite quickly; however, we didn’t get to sleep for very long. The next day began at 8:00 am, giving us at least a bit more than 4 hours to sleep. And the day started exactly like the last one had ended; our bus journey to the Ajanta caves didn’t take 1.5 hours as it was supposed to, but instead we arrived after another 4 hours on the bus. For the entire afternoon, our guide led us through several Buddhist caves, all carved monolithically out of the cliff. Some of them were simply places of worship and meditation while others were complete monasteries containing bedrooms, meditation rooms and a stairway down to the river. These caves were one of the most impressive things I have ever seen, especially due to the fact that they were caused by one thing: religion. For me, religion is one of the most fascinating, yet hardest things to comprehend in life. I really wish that I could understand how someone could dedicate their entire life to worshipping something that’s not necessarily physical. After a short meal in a restaurant at the foot of the mountain, we finally drove back to the hotel and after a nice swim eventually fell into bed as exhausted as the day before. 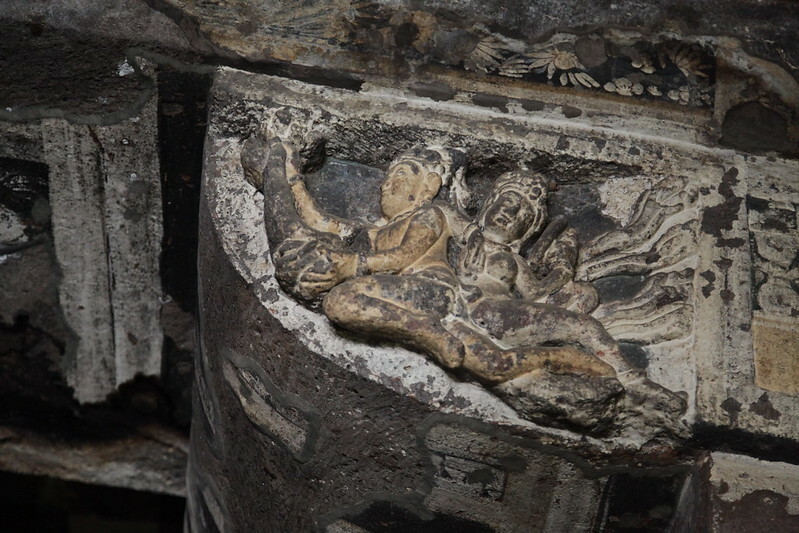 Although I was still very impressed by what I had seen in Ajanta, the next day managed to completely blow my mind. 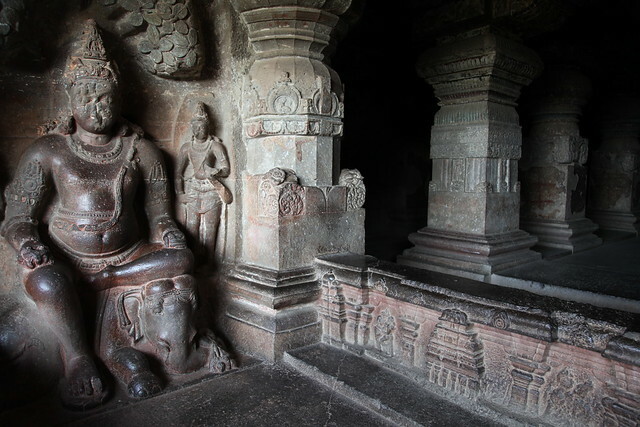 The Ellora caves were unlike anything I had seen before. We visited three different caves; a Jain, a Buddhist and a Hindu. At first, the Jain cave looked very much like the Buddhist ones we had seen the day before; however, the moment our guide led us up the stairs and through several well hidden paths, it changed. Instead of feeling like being in a small cave, it felt much more like being inside a massive complex within the mountain. And even though the Buddhist cave had the exact same structure as the ones we had visited the day before, it was much more quiet and peaceful. It really was a place for us to just sit, wander and think. However, one place I definitely won’t forget is the Hindu cave, or rather, the Hindu complex or temple. The Hindu complex was a massive monolithic structure cut out of the cliff from top to bottom, including a wall, several massive pillars, 5 small temples, and one big one in the center. 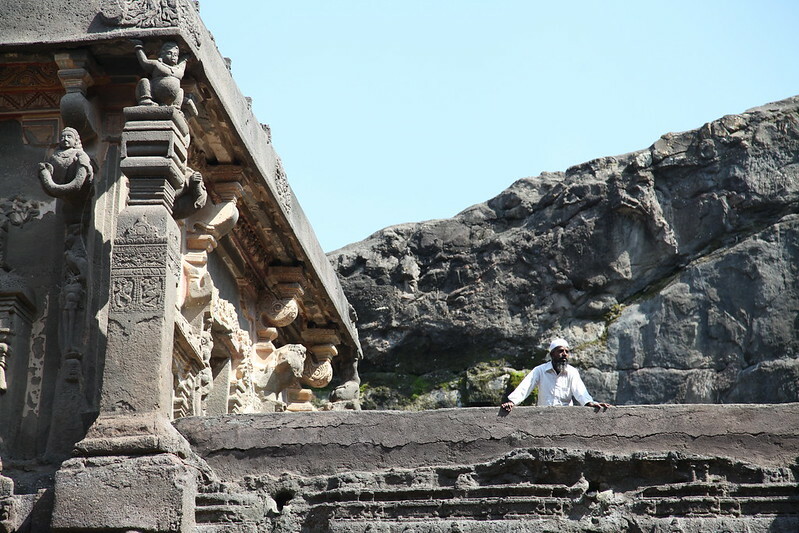 It took the people of Ellora over 200 hundred years and eight generations to build this structure. All of the walls showed carvings of Hindu gods and deities, including the three main gods Shiva, Brahma and Vishnu. To be honest, I think that this was the most incredible and unimaginable thing that I’ve seen so far in my life, and I definitely won’t be able to forget it.